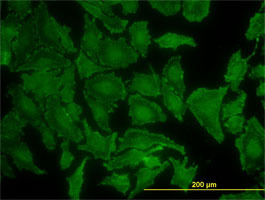 Immunofluorescence showing KRAS in HeLa cells using preservative free Mouse anti Human KRAS antibody, clone 3B10-2F2 (MCA3223Z). 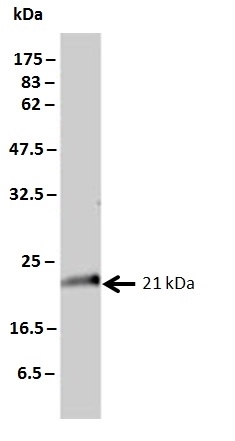 Western blot analysis of KRAS expression in HeLa cell lysate using preservative free Mouse anti Human KRAS antibody, clone 3B10-2F2 (MCA3223Z). Mouse anti Human KRAS antibody, clone 3B10-2F2 recognizes human KRAS, also known as GTPase KRas or c-Ki-ras. KRAS is a 189 amino acid ~21 kDa membrane bound cytosolic protein involved in the regulation of cell proliferation. Defects in the KRAS gene have beel implicated in leukemias, Noonan syndrome and gastric cancer (UniProt: P01116). Mouse anti Human KRAS antibody, clone 3B10-2F2 has been used successfully for the domonstration of KRAS expression in malignant peripheral nerve sheath tumor cell lysates by western blotting (Miller et al. 2013). Recombinant protein corresponding to aa 1 - 189 of human KRAS. Kohli, L .et al. (2013) 4-Hydroxytamoxifen induces autophagic death through K-Ras degradation. Cancer Res. 73 (14): 4395-405. Brossier, N.M. et al. (2015) Classic Ras Proteins Promote Proliferation and Survival via Distinct Phosphoproteome Alterations in Neurofibromin-Null Malignant Peripheral Nerve Sheath Tumor Cells. J Neuropathol Exp Neurol. 74 (6): 568-86.